Just across the Mystic River in Chelsea, Massachusetts, the Chelsea Clock Company has been manufacturing time pieces since the 1840s. For decades they have been a supplier to the US Navy-the company's products are the kind of sturdy, reliable, accurate products that mariners and sailors depend on and demand. 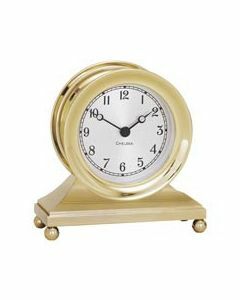 Their clocks are also classic in design, handsome in appearance, and always beautifully packaged. They are often given to visiting dignitaries from all over the world as examples of American craftsmanship. 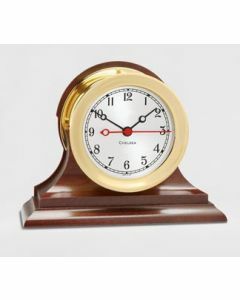 Our collection includes a range of clocks that suit almost any gift-giving occasion or fit into almost any home or office interior. 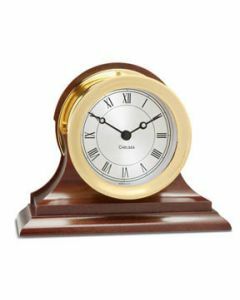 From the simple, elegant waterfall sure to brighten the top of a desk or bureau, to the magnificent mahogany based- ship strike clock with its melodious tones, we probably have a clock that will be just right for you. 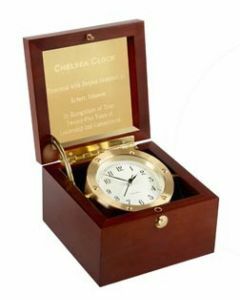 If you have further questions about our Chelsea Clock selection, please call us at (617) 426-1812, ext. 122.